NGC 6559 is an active star forming region in the constellation of Sagittarius. 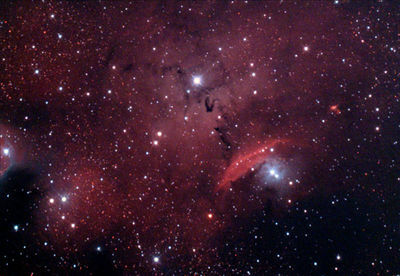 This nebulosity contains emission (red), reflection (blue), and dust lanes (black) regions. This photo is a combination of 240minutes of exposure with a Canon 60Da, Badder UHC-S filter, connected to a TPO RC telescope on a Celestron CGEM mount.